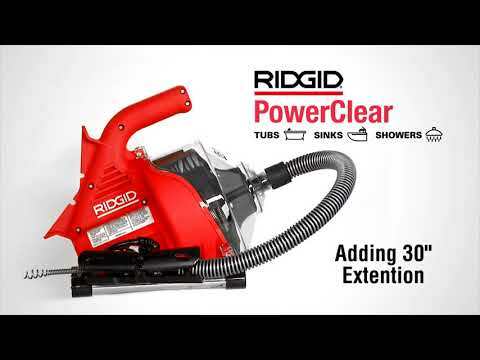 The powerful, compact and versatile new PowerClear™ drain cleaner effortlessly cleans tub, shower or sink blockages from 3/4" (20mm) to 1 1/2" (40mm) diameter. Its lightweight design makes it easy to maneuver in small spaces like under a sink. 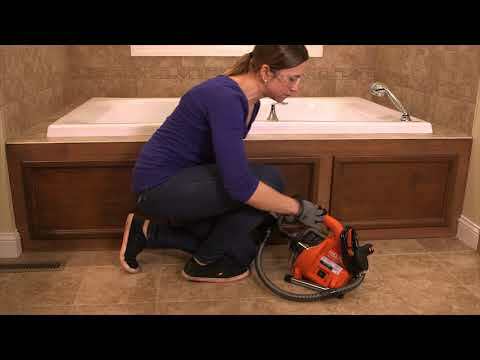 PowerClear™ Drain Cleaning Machine is rated 4.3 out of 5 by 45. Rated 4 out of 5 by JohnnyRocket from Too soon to tell Product worked fine for the job that I had to do so far. As for durability. Having used it once so far I cannot honestly say. But! If it is as good as all of my other ridged tools I am sure it will be good. Rated 5 out of 5 by Hanleyshandymanservice from Worked as advertised I'm a handyman always looking to add to my arsenal. The product looked well constructed and durable. Was easy to use out of the box and the self feed made the decision to buy easy. Only thing I'd like to see different is an option to put on a more aggressive tool. Great price especially if you only need to clear 2" pipe or less. Rated 5 out of 5 by KenDail from Works as Advertised I believe this is a well-made product. Seems sturdy and built-to-last. I took some time to read the manual and was able to easily assemble the pieces and use this product. It worked great for my bathtub drain. I'm very happy with this purchase. As long as you follow the manual for operation and care, this product should last a long time. Rated 5 out of 5 by Jtplumbcrazy from Great product only 1 issue Overall the machine is great except for the fact that the first initial use the rod was coiling up wrong so I had to take it apart and get it untangled. Other than that it worked great! Rated 5 out of 5 by Carlos6331 from super easy one person operation Cleared clogged kitchen sink in less than 5 minutes. Highly recommend for ease of use and effectiveness. Rated 5 out of 5 by DATCH from Very impressive!! This product is very versatile, light weight and a joy to operate. Every one of our maintenance men will receive one of these to use on our property. Rated 4 out of 5 by Jopo from Good product. Wish it would come with the option of a 50 ft head . Needs to have unchangeable lengths. Other wise it a very descent product. Why does the cable bind in the drum every time I retract it in? This is an on going issue. The only way I've thought to resolve this is to not attach the cable end to the hold down on inside of the drum.